GREAT RIDERS AREN'T BORN, THEY'RE MADE. WHETHER YOU'RE A BEGINNER OR AN ADVANCED RIDER, THERE'S ALWAYS A TRICK OR TWO WE CAN TEACH YOU! 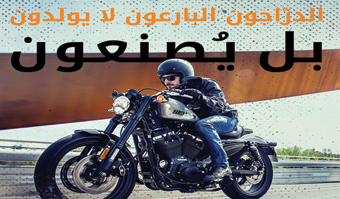 GET IN TOUCH WITH HARLEY-DAVIDSON® KSA DEALERSHIP (DHAHRAN, JUBAIL, JEDDAH OR RIYADH) AND BOOK YOUR MOTORCYCLE TRAINING SESSION. © 2001-2015 H-D. All rights reserved.